Prime Minister Lee Nak-yon has called on South Korean athletes participating in the upcoming Asian Games to do their best for inter-Korean cooperation as well as in their respective competitions. Lee made the request during a ceremony at the Olympic Park in Seoul on Tuesday that marked the creation of Team Korea for the Asian Games in Indonesia, where the two Koreas will enter joint teams in three sports. 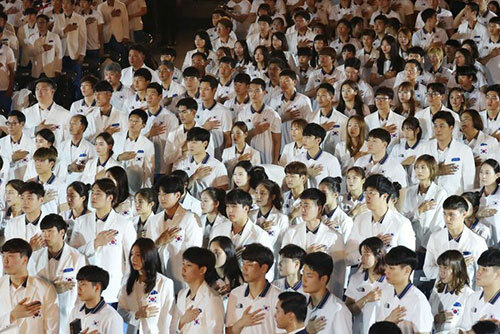 Lee said the joint marching ceremony and the chance to compete alongside North Korean athletes will be a valuable experience for the South Korean competitors. He then urged them to be considerate of their North Korean teammates and cooperate with them both inside and outside the stadiums. He also asked them to pride themselves on contributing to national reconciliation and peace-building. Calling the entry to the Asian Games a “once-in-a-lifetime” opportunity for many, the prime minister also urged them to make the most of the chance. More than two dozen North Korean athletes will join forces with those from the South in dragon boat racing, women's basketball and rowing at the Asian Games that run from August 18th to September second.